Unbelievably good condition! 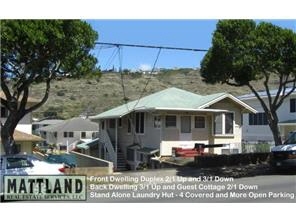 Perfect location just a couple of blocks from downtown kaimuki. The front dwelling is a duplex, 2/1 up and 3/1 down each with its own electric meter. Stand alone laundry/utility room, two 2 car carports and room for additional parking on the lot. The back dwelling is a 3/1 up with gorgeous antique douglas fir floors and mountain views. Downstairs is a separate entry 2/1 guest cottage w/o a kitchen but does have a large full bath including a stainless steel tub. Extra large area under the back house used as a hobby area and tool storage.